Mary Massery was selected as the 2015 Rocky Mountain University of Health Professions (RMUoHP) Outstanding Alumnus/Alumna. This award is one of the highest honors a RMUoHP graduate can receive for distinguished contributions to his/her profession and for community service. She was presented with the award at RMUoHP’s commencement ceremony on August 1, 2015. Mary has been honored as Outstanding Alumnus of the Year by each of her 3 alma maters. 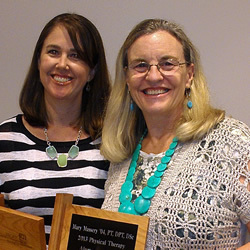 Mary was awarded the Physical Therapy Alumna of the Year Award from her DPT alma mater: The University of the Pacific Thomas J. Long School of Pharmacy and Health Sciences. 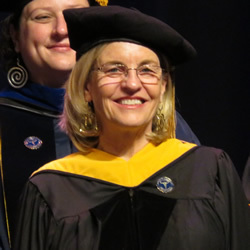 She then presented the Keynote Address at the White Coat Ceremony for the DPT Class of 2015 as well as presenting the Distinguished George H. Sanderson Lecture to physical therapy faculty and the greater Stockton physical therapy community. This APTA Section award was created to recognize individuals who have demonstrated excellence in either clinical practice, academic practice or in the area of research and who have demonstrated contributions to the Association through state, section or national involvement. The award is named for Dr. Linda Crane, whose clinical practice specialty was in the area of pediatric cardiovascular and pulmonary therapy. The recipient of the award will provide a one hour presentation at the APTA Combined Sections Meeting, followed by a written copy of the speech to be published, and will receive a monetary award of $500. When the APTA achieves its 2020 vision, physical therapists will be autonomous practitioners and the practitioners of choice for motor impairments. As a profession, are we ready to take on the diagnostic role? The speaker will present the diagnostic puzzle, composed of many pieces, each being important to the full patient picture. She will incorporate the obvious “pieces”: the musculoskeletal and neuromuscular systems, but she will challenge therapists to add the less obvious “pieces” to every motor evaluation and examination: the cardiovascular/pulmonary, integument/fascial, and internal organs systems, in order to discriminate between the cause and the consequence of the impairment. She will argue that the cardiovascular/pulmonary system is the thread that ties the puzzle together and should be an integral part of every motor assessment from the head down to the toes. Present a broader view of motor assessment that systematically includes the whole body, looking beyond the obvious musculoskeletal and neuromuscular systems. Discuss the role of the cardiovascular/pulmonary, integument/fascial, and internal organs systems in the assessment of motor dysfunction. State the case that multi-system evaluations should be the standard of practice for a profession that desires to develop competent, autonomous practitioners who are truly ready to be the practitioners of choice in the future. In 2003, Mary was awarded the Distinguished Alumnus Award from her alma mater: Northwestern University Department of Physical Therapy and Human Movement Sciences. 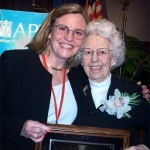 The American Physical Therapy Association has awarded the prestigious 2002 Florence Kendall Practice Award to Mary Massery, PT, a 1977 Northwestern University graduate and current doctoral student at Rocky Mountain University. 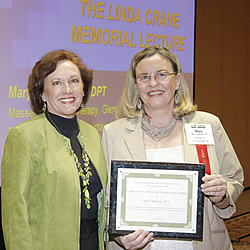 The purpose of the award is “to acknowledge an individual who has made outstanding and enduring contributions to the practice of physical therapy as exemplified in the professional careers of Henry O. and Florence P. Kendall.” Ms. Massery was presented with this award in Cincinnati at the National APTA conference on June 5th, 2002. Ms. Massery specializes in identifying and treating ventilation impairments in both children and adult populations. As a new graduate, Massery noticed that her colleagues perceived the cardiopulmonary system as primarily a “medical” problem area. She embarked on what has become a career-long mission to change the way that physical therapists look at respiration. Through her extensive treating, teaching, writing, consulting, and mentoring, she has challenged physical therapists all across North America to recognize that every muscle of the trunk has a dual role in respiration and the postural control of movement. Thus, Massery has insisted that the cardiopulmonary system cannot be evaluated and treated separately from issues pertaining to motor performance; that breathing must be viewed as part of the natural interactions that occur between the sensory-motor system and the cardiopulmonary system, rather than as separate occurrences. Her philosophy is part of a major paradigm shift in the way that clinicians view breathing and movement, and breathing and health. Physical therapists are now beginning to purposely include the cardiopulmonary system in their motor planning strategies for their patients with movement dysfunction. This allows the clinician to view the pulmonary system as an asset rather than a liability for the patient. Massery’s long stated mission statement of her private practice is “to teach my way out of a job.” In other words, she feels that when physical therapists have integrated these concepts into everyday practice, there would be no further need for her specialized knowledge. The Florence Kendall award acknowledges Massery’s work toward this goal.